A forum for staff of the Newman Library to share information and exchange ideas pertaining to library and information science. I’m intrigued by libraries that are trying to find creative ways to cut down on the number of places users have to go to search for information. First, we had federated search tools that sent out searches to a bunch of places and aggregated the results; now we’re seeing discovery layers (like Summon, Primo, EBSCO Discovery, WorldCat Local, VuFind, Project Blacklight, etc.) that aggregate content into a single index and offer search results more quickly than federated search typically can. 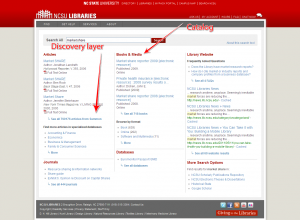 Still, these new discovery layers may not be the ideal search tool for every silo the library owns or licenses. 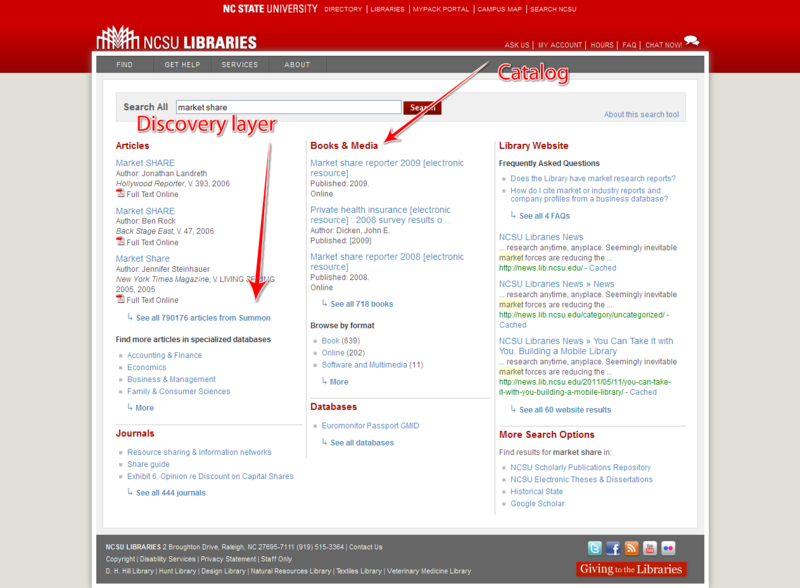 This federated “search all” feature on the NCSU libraries web site actually pulls together a number of different search tools, which are explained more fully elsewhere on the site. Librarians at the Leddy Library at the University of Windsor are at work now on a tool called Jamun that does something similar: it gives the user a single search box that will do a federated search across several different silos and present those results spread across the page in different categories. This project is being built using a Google Custom Search engine. You can learn more about it from the video recording the presentation about it at the recent Code4Lib North event and by checking out Mita Williams’ blog post about it (which includes an embedded slidecast) and Art Rhyno’s blog post from April. This entry was posted in Uncategorized and tagged Discovery tools, Federated search, Google Custom Search, Summon. Bookmark the permalink.